Samsung’s Experience app lets you try out the Galaxy S9, giving you a taste of what to expect from the phone. While it may not be the same as an actual S9, it’s still something. So you loved the Galaxy S9 and can’t wait for the phone to arrive? Or you don’t have the money to purchase one? Don’t worry, this nifty little app has got you covered. The new app in question is Samsung Experience, which is a way for the Korean company to give a taste of some of the new features found in the Galaxy S9 and S9+ to everyone. The app has been segmented into four separate sections, each highlighting a different feature of the S9: New Camera & More, S9 Accessories, Help Applications, and Device Specifications. Each section details S9’s features, either in written or in visual form. It is a good way to make up your mind whether you need to spend nearly Rs. 100,000 on a new phone, before actually trying out the phone itself. S9 camera should show off features such as slow-motion video (don’t expect it to improve your own camera), while the Helpful Applications demo-ing wireless charging and external docks that are compatible with the S9. AR Emoji are also included, in case you think you’re missing out on an important feature. Device specifications should give you an idea of what to expect, specification-wise. Helpful Applications also should highlight the dozens of software related tricks (and gimmicks) that Samsung adds to its phones. The app is available in Google Play Store now, for phones running on Android 6.0 and above. It should keep you occupied, at least, until your flashy S9 arrives. The only concern should be its size, which at 743 MB means you must have a good internet connection at the ready. just videos and videos – wont turn your phone into S9. 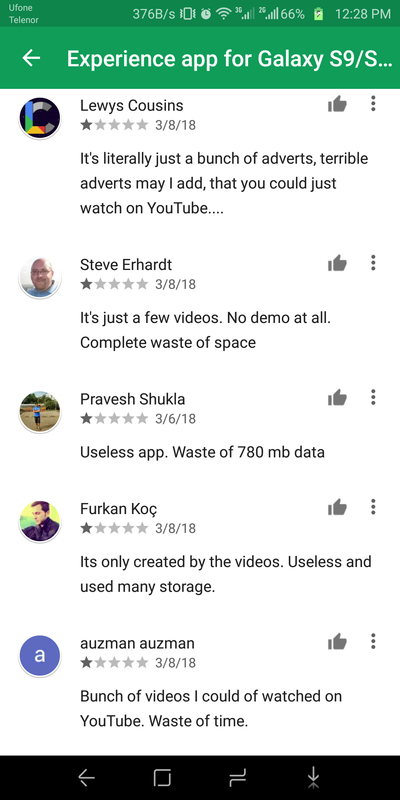 For clarity do read the Google Play Store reviews! Look how Samsung plan to mislead people. I had understood this is an advertisement, not a fair application. Samsung think people are fools.